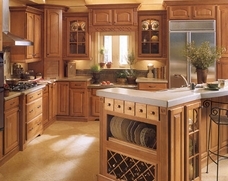 Couple quality construction with beauty and affordability and you come up with Timberlake Cabinetry. Timberlake kitchen cabinets are built to order, so crafting a kitchen that fits your taste and your needs is easier than ever before. Plus, Timberlake kitchen cabinets come in three product tiers, so you won’t have to wait any longer to build the kitchen you want. Timberlake Cabinetry also boasts a large selection of imaginative additions to help your kitchen cabinets fit your exact needs, and their line of hardware accessories gives you more freedom to personalize your home. From the very beginning of the construction process, Timberlake has its customers’ best interests in mind. That’s why they participate in KCMA’s Environmental Stewardship Program, proudly producing 95% of Timberlake Cabinetry from verified sustainable American hardwoods.